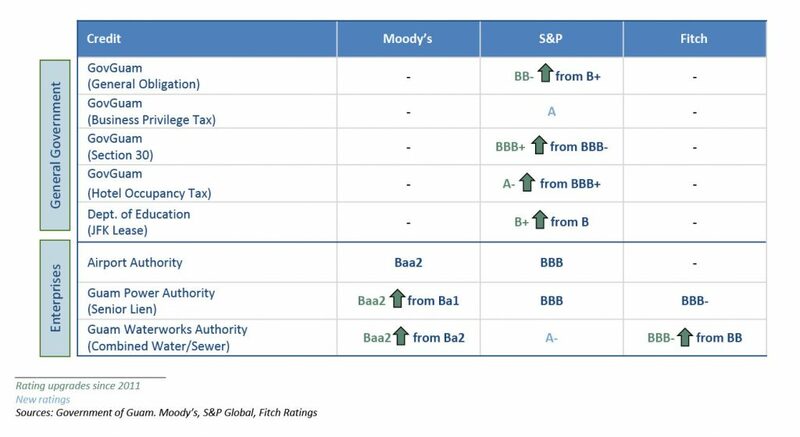 Guam's Ratings Have Improved Since 2011. 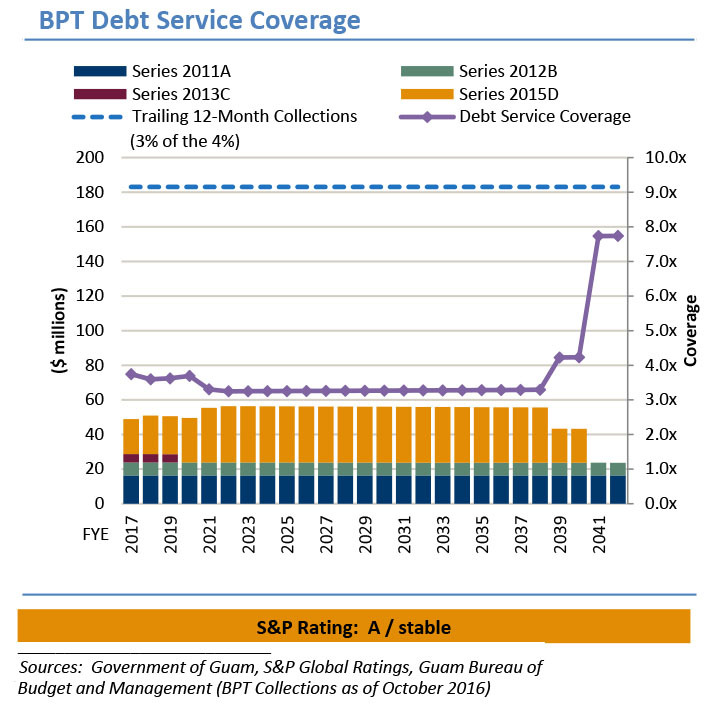 Guam's centralized consolidated debt issuance is reflected in overall debt levels. 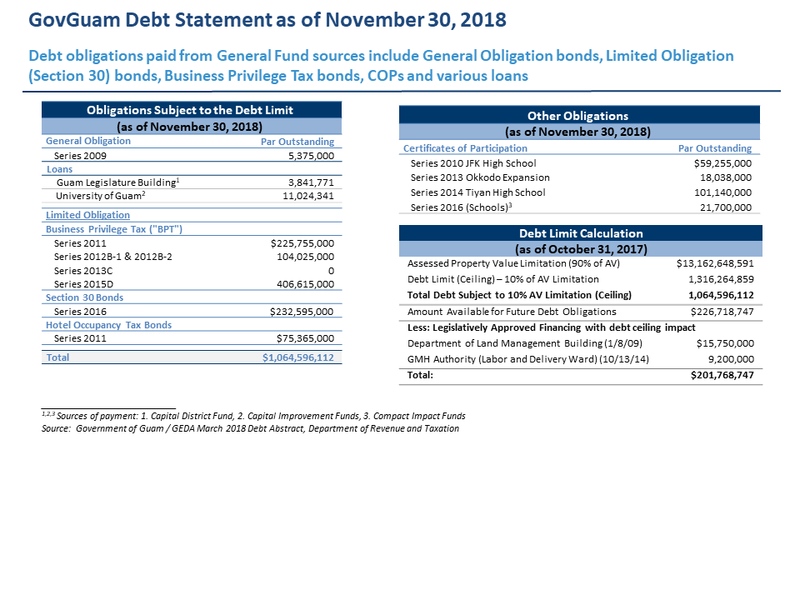 Debt obligations paid from General Fund sources include General Obligation bonds, Limited Obligation (Section 30) bonds, Business Privilege Tax bonds, COPs and various loans. Capital Plan includes a limited number of potential new money projects. Action by Congress and the President would be required before an oversight board could be established for any territory other than Puerto Rico. 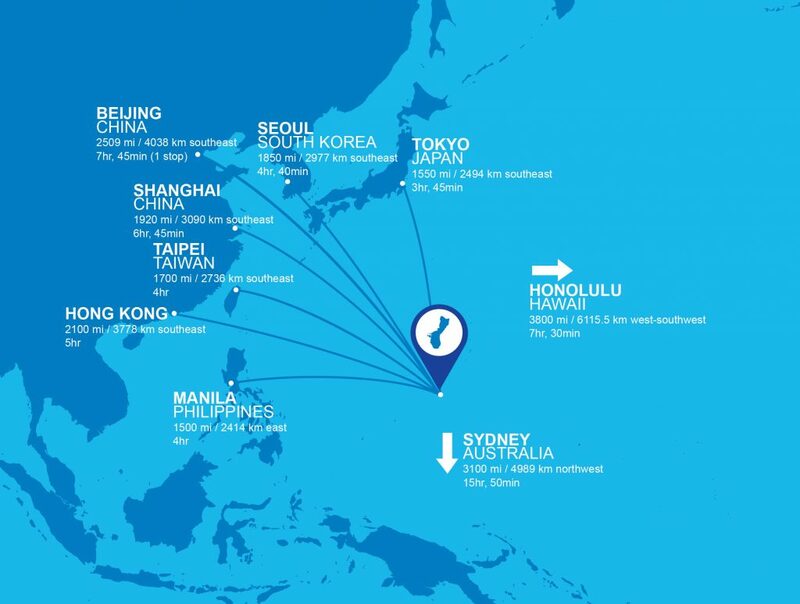 Guam’s economy performed well over the past decade and is poised for additional growth. Construction industry increased by 530 jobs compared to the previous year. Both public and private sector employment has grown by a compound annual growth rate of 0.52% in the past 10 years. 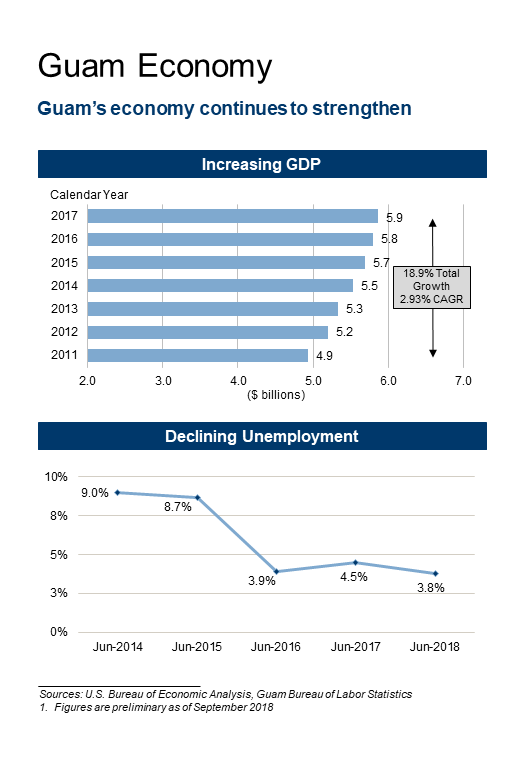 Guam’s economy has shown steady growth over the past decade and its economy continues to show signs of additional expansion. 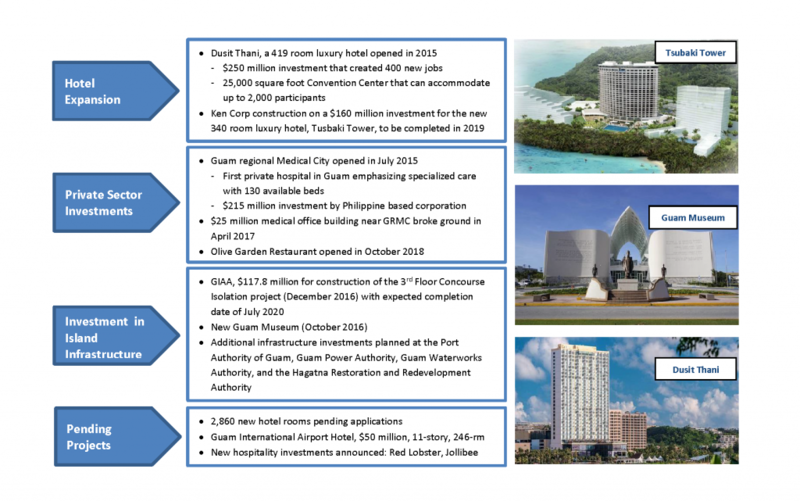 Tsubaki Tower, a $164 million, 340-room hotel in Tumon with est. completion in 2020. FY2018 construction permits reached $366 million. $9.9 million, 50 housing units in six two story apartment buildings. $10.4 million for construction of a new Chapter School, Ilearn Academy. $7.2 million, Amantes Residence, 420 condominium units, adjacent to Two Lovers Point. $7 million, 33 new housing project in the southern part of Guam. $79.4 million in water system reservoir improvements and $20.9 million in water distribution system pipe replacements and upgrades as part of GWA’s $128.4 million CIP projects. The projects are expected to be complete between 2019 and 2020. $77 million for a new Simon Sanchez High School as part of DOE’s $100 million CIP. The project is expected to be complete in late 2019. The $117.8 million Airport project includes modifications to the terminal and the construction of a third floor concourse. Construction is expected to be complete around July 2020. 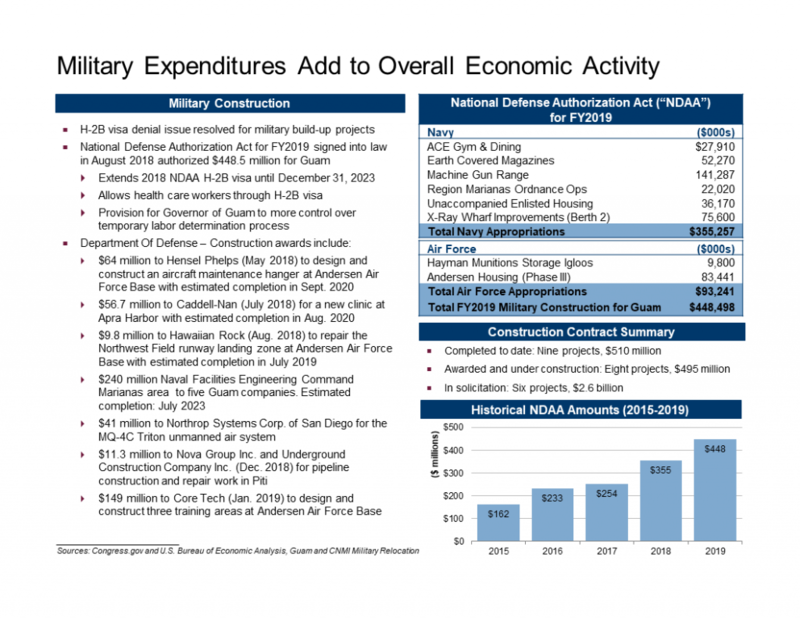 FY2019 National Defense Authorization Act (NDAA), signed into law in August 2018, authorizing $448.5 million for Guam. Recently completed projects demonstrate diverse economic development and provide a solid foundation for sustained economic growth. 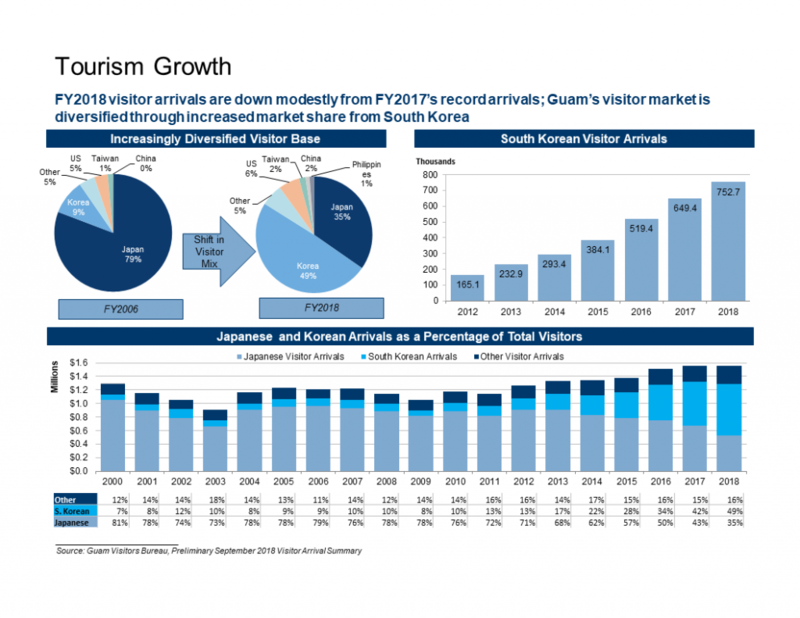 Since 2012, visitor arrivals have grown 19% and Guam’s tourism base continues to expand and diversify. 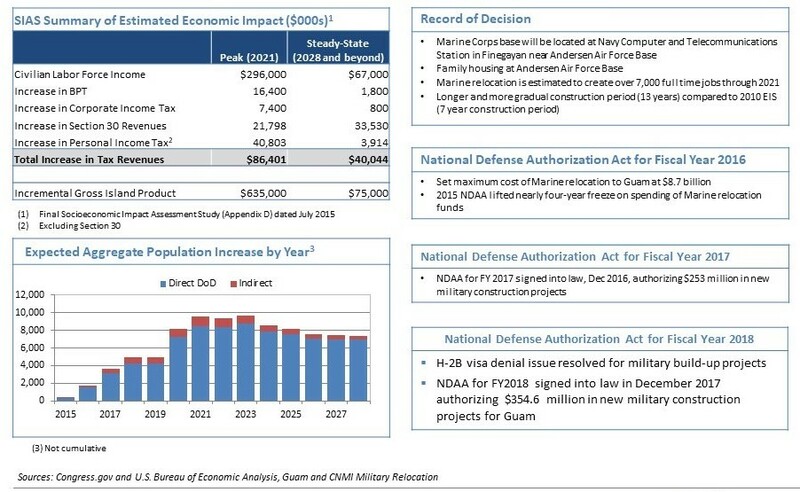 The signing of the Record of Decision (ROD) in August 2015 for the Marine relocation began the process for significant additional military investment in Guam. 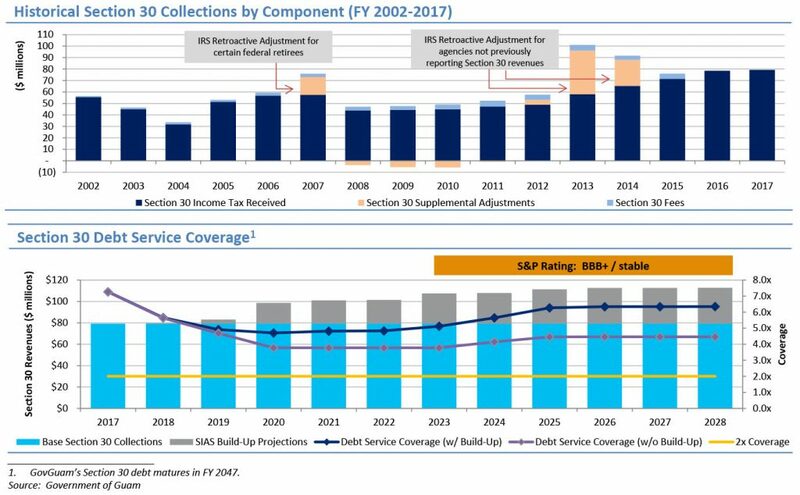 Government of Guam reduced spending levels to create a balanced budget without adding to the deficit. Guam is keenly focused on managing its pension obligations. 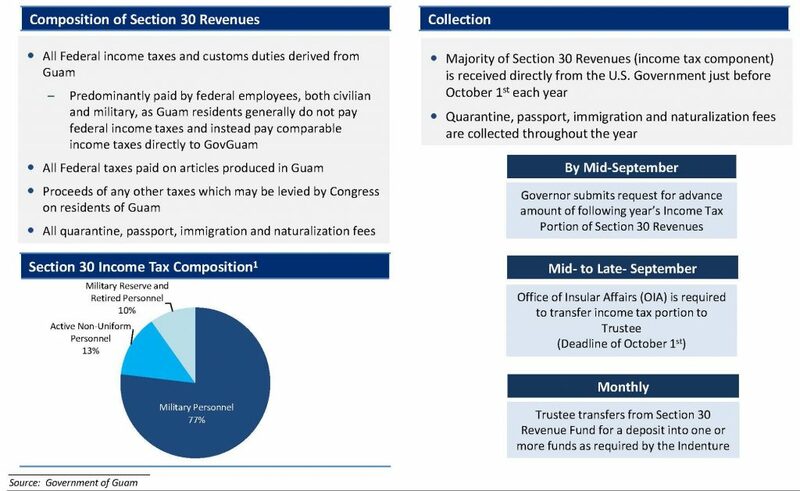 The Government’s right to receive Section 30 Revenues is granted by Section 30 of the Organic Act and GovGuam has been collecting Section 30 Revenues since 1978. 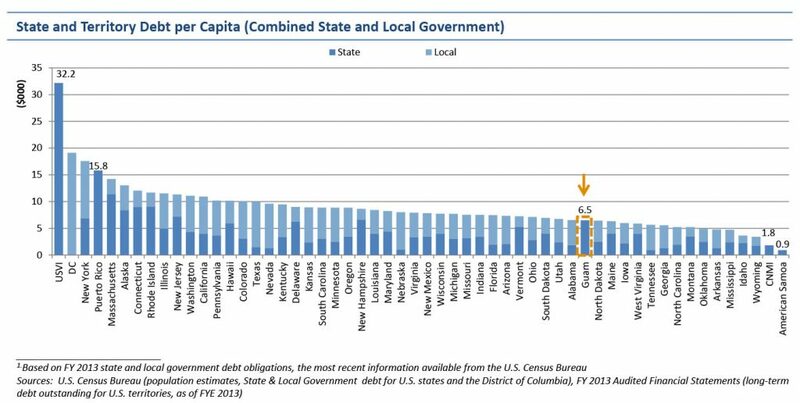 Historically, over 90% of the Section 30 revenues are paid by the federal government directly to the Trustee in the form of an estimated lump sum payment each September. 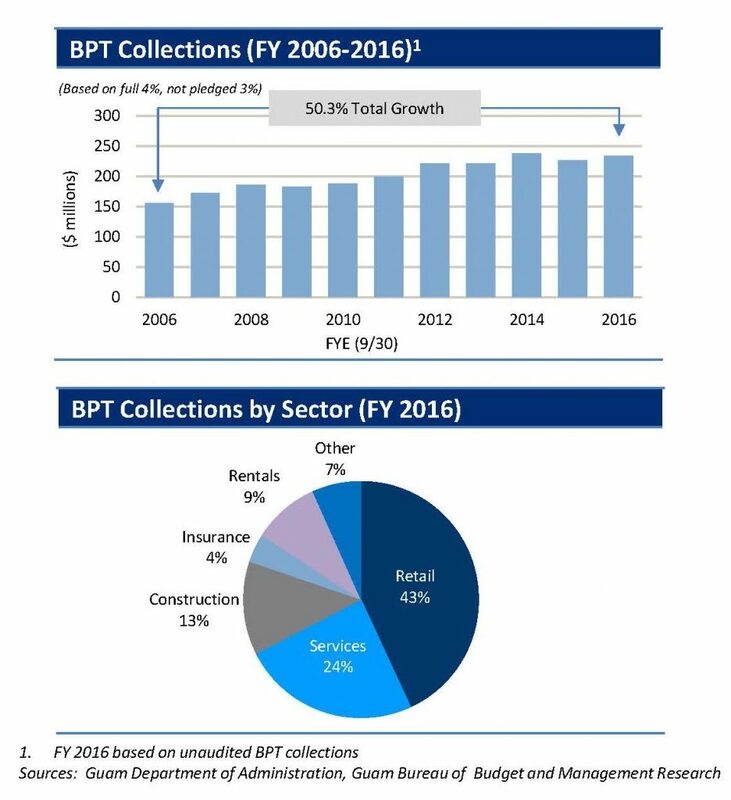 The BPT is a comprehensive tax on goods, services and the sale of tangible property with a historical collection rate of approximately 95%.